With New Year comes the obligatory New Year’s resolution. I’ve made a few “promises” to myself and one of them is to entertain more (aka stop being a cave-dweller). I would like to have our friends over much more often, maybe throw a few more dinner parties and in general be more sociable. To achieve it, I need space. So the question becomes: What do I do? 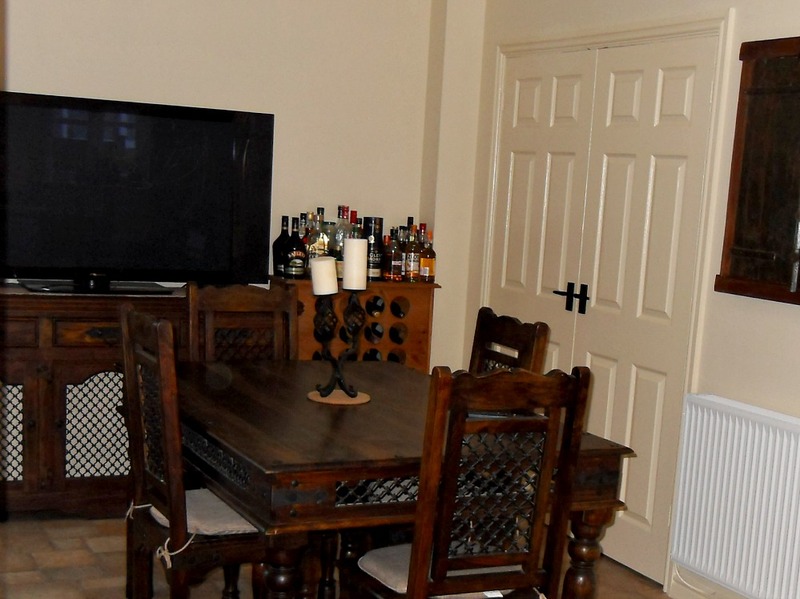 Currently, we have a kitchen / dinner with a table set for four and a front room designed around our family entertainment – large sofa, space to play jumpy console games and to chillax in general. I think the front room will have to stay as it is simply because it is our family space and besides I don’t know how to tell Mark his front room is about to change. Now the dining room part of the downstairs area might just be the subject of a make-over. In order to entertain I will need space. If we have more than two people visit us be are quickly reminded of a major drawback to us entertaining. Sitting for hours on little wooden stools is not very comfortable, no matter how good the food, the company or even how many drinks you have had 😉 and there is no room to add full size chairs as the table just isn’t long enough, oh and it has very fat legs that don’t help. The easiest solution would be to just buy a new set of slim chairs, but as our furniture’s quite old I am not able to find anything to match it nicely. I like dark wood; solid wood, heavy furniture is very me but they make the space seems smaller and darker than it actually is. The more I think about it the more I feel I might be ready for a change. Would you attempt a make-over just to satisfy your need for fulfilling a New Year’s resolution? Do you think I should just stick with my old furniture and maybe invest in some soft cushions to make long evenings by the table more comfortable? I know this is a long list of questions but I am quite in the pickle and unsure what to do next. I love your post! Your blog is so awesome as well! They are all beautiful! I don’t really know which on you should choose… The third table is the best, in my opinion, but I don’t like the chairs that much. These are great set of choices. Every one of them looks unique & great. I love the Clemence Richard Massive & Qualita Goliath so much. The Clemence Richard table is my favourite from your choices! I LOVE the 8 person table. There are 7 of us and have very little room. This would be my dream table! I love your choices, all of them! I’d love a bigger dining room than we have. We can seat 6 comfortably, I’d love to be able to double it! Wow, 12 people at the table! Wouldn’t this be just awesome? I would invest in some soft cushions. But you have picked some beautiful furniture. I like the top two choices! It definitely leaves you with more room to entertain with all those chairs. A lot of great choices. I just got a new table and chairs. Mine has marble/stones in it. I like the solid would look. I love the Derwent but all the choices are lovely! I would love to entertain more too. I just don’t see it happen! I like the Richard Clarence table because it looks strong, but not the chairs. It all depends on the kind of money you have to spend. I always say refurbish and choose your own ideas on what you want to live with for a long time. I like the set you have. I think entertaining is more about the people. I have had wonderful evenings with folks who had little or no furniture as well as those who had abundance. It was the people I was with that mattered. Perhaps, if your budget doesn’t allow a new dining room set, you’ll discover your creative passion and flair for themed entertainment where there is transition! I think I might take a small survey and find out what our friends really think. I was thinking about painting the whole set but there is so much metal detail and I am just scared I am not up to the task. I prefer the dark colour of the table set you have in your kitchen. Not too keen on the massive legs of one of the sets you’re considering. The solution with small dining space is usually to start with drinks in the room where you have soft sofa and chairs, then withdraw there again after dinner rather than spend the whole evening at the table? Agreed. This would be ideal. Maybe I can add a small table in my front room, which would help. Thank you Galina. I am always scared of glass top tables. I know they aren’t going to break but still… something leaves me very uneasy about them. On the plus side, if I had a glass top table Bunk wouldn’t chew it, like he did with our wooden one.